Three separate rooms: 1. 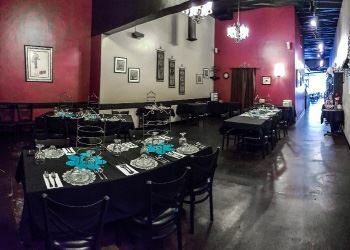 French-deco Tea Parlor (35 people) that hosts tea sittings, bridal showers, baby showers, Ladies Night Out events, business meetings, seminars, etc. 2. Party Room (16 people) hosts full-featured themed girls birthday parties (Princess, Diva Salon, Crazy Hair Salon, Tea Party, etc.). Also used for smaller meetings. 3. Family Cafe and Ice Cream Parlor (great food, hand made ice cream, lattes, etc.) holds about 25 people. Beautiful French-deco art and design. Black tablecloths, white doilies, crystal plates, 3-tier stands, beautiful lighting, beautiful background music. Atmosphere/Decor: See description. This room is beautiful! Special Features: High ceilings, surround sound, Vanity Closet (dress up closet). OMG! This tea parlor has more than meets the eye! I attended a fun Bridal Shower for my best friend and learned a LOT about this location during my experience there! They have a separate family cafe up in the front of the building (sandwiches, salads, soup, espresso drinks, handmade ice cream, gift shop, smoothies, etc.). Our shower was in the french deco tea parlor. It was FUN and they hosted the whole thing (custom invitations, hostess, games, prizes, wonderful high tea meal, cake, and dress-up closet). During the shower we got to watch a dozen princesses parade by to a back room where they have a party room. I peeked back there and it was a BEAUTIFUL princess room. It looked like a FUN birthday party!